We have discovered a new favorite children’s book author. When Ella pulled Dahlia off the shelf at the library a few months ago, we hadn’t read anything by Barbara McClintock before then. We all loved the illustrations, the characters, and the story. Ella spent a few days doing her best to dress like Charlotte, the main character in the story. The next time we went to the library, we picked up two more books by McClintock. 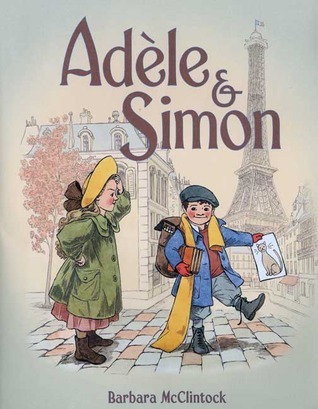 Adele & Simon is such a fun book about a brother and sister who live in Paris in 1907. Adele picks Simon up from school and warns him not to lose any of the many things he is carrying: hat, gloves, coat, books, etc. As the children enjoy the afternoon in Paris, Simon steadily loses his things at each (gorgeous!) stop. My children had such fun trying to find Simon’s missing belonging on each page, and looking at the map at the end of the book. The book is beautiful, educational, and a good conversation starter about how brothers and sisters relate. And it’s just fun. 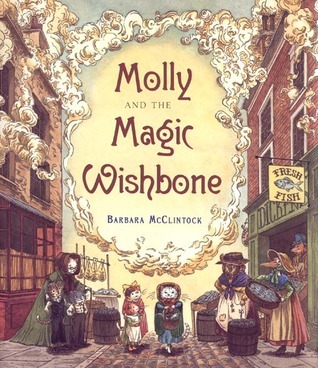 Molly and the Magic Wishbone is another gem by McClintock. This time, the main characters are all cats dressed in Dickensian clothing. Based on a short story by Dickens, Molly is the oldest sister of a family of cats who depend on her to take care of them when her mother is sick. She has the good fortune of meeting her fairy godmother on the streets of London on her way back from the fish market. Her fairy godmother tells her she will find a magic wishbone in her fish that night, and that she should take care of it as it will grant her one wish. Molly’s choice of wish and relationship with her siblings is heart warming. Once again, the illustrations are whimsical and detailed. My son especially loved the pictures that included all kinds of animals wearing suits and dresses. It sounds absurd, but McClintock makes it look almost normal. Now we’re looking forward to reading Adele & Simon in America and The Fantastic Drawings of Danielle. I highly recommend Barbara McClintock’s books, especially if you have a little girl. Or even if you have no children at all. I would read them to myself just to look at the pictures. This is Day 22 of 31 Days of Picture Books. To see the other posts in the series, go here. Thank you! I’m glad you found me, and I hope you find lots of good reads through this blog!